Back to our regularly scheduled program. Sorry for the sporatic updates but I will be back on track. I regularly get emails from Real Simple with fun tips for decorating or creating recipes on a budget and want to share with a few of their Low Cost Decorating Tips. 1. Create as Side Table: Stack modular storage units to make a stepped side table with surfaces for displays and lighting. Create miniature still lifes in the cubbies, or stack reading material that you’re going to get to...someday. 2. Hang Plates: Plates in unexpected colors make a fresh wall arrangement. Vary hues (within a family), sizes, textures. Put the most dramatic plate toward the center (lay out the plates first to experiment); attach wire plate hangers and hang plates on picture nails. 3. Make Your Own Art: Even photocopied art looks sophisticated when it floats between two pieces of glass. The wall color shows through the glass, creating the illusion of a custom mat. 4. Stack Your Books: Piled books draw the eye. If shelves aren’t high enough or deep enough to accommodate oversize books, stack them on a flat surface, such as a bench or an end table. 5. 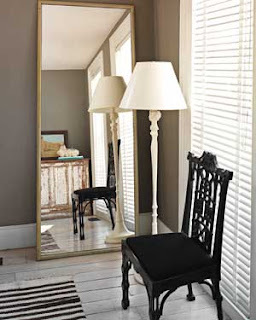 Amplify Your Space: Tight spaces expand and rooms seem roomier when you prop up a large mirror (at least three-fourths as tall as the wall). It’s a classic interior decorator’s trick to create instant―if not real―square footage. I think that the title of the post says it all. 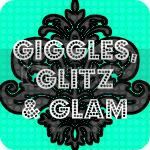 :) My friend Jana over at Giggles, Glitz and Glam is hosting a giveaway in honor of her birthday. She will be posting an item starting this morning at 3:30am until Friday the 22nd. One of my items will be featured as part of the giveaway, it is one my newest items. Be sure go to her blog to check it out all the fun itmes that others have donated for this fun event! Well the boutique is over as is the stress. Now back to reality, which is that fact that my house is a disaster after 2 weeks of somewhat neglect. I will be posting my adventure soon with a picture of my booth.